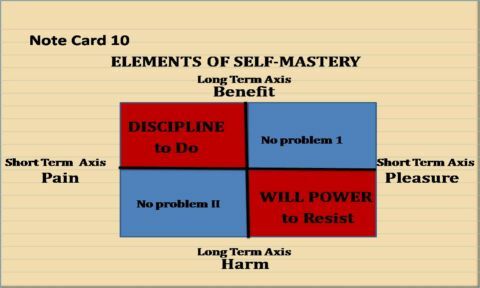 Self-mastery includes discipline and will power. These concepts have been used interchangeably, but I believe they describe separate behaviors requiring different strategies to develop. They may be distinguished by a simple concept table. The horizontal axis captures short term outcomes: pain and pleasure. The vertical axis captures long term outcomes: harm and benefit. For most people, activities that produce short term pain and long term harm will not be undertaken so will not be a problem. For example, sticking one’s hand in a fire is not an activity anyone would do, unless motivated by a perverse psychological need. Likewise, undertaking an activity that produces short term pleasure and long term benefit is not a problem. Laughter provides pleasure and as research is beginning to show, has long term benefit from stress reduction. Problems arise from the remaining two categories: will power and discipline. As children we learn to delay gratification for future benefits. This learned response is re-enforced by our parents, so that we are able to recognize the long term danger even though we are attracted to the short term pleasure. Will power is the learned response to resist short term pleasure to avoid long term harm. For example, if you are allergic to honey, even though you love the taste of it, you cannot, and will not, eat it because it may cause you a severe reaction. Will power requires a passive form of energy. Discipline, however, requires an active form of energy. Activities that are painful in the short term but produce benefits in the long term are a form of mental and emotional toughness that all successful adults exhibit. Exercising is a good example: discipline is required to get up every morning to run 3 miles in the dark. Discipline is also a learned process but its growth starts later in life as the child becomes more self-directed. The mystery of discipline is how it gets nurtured and how it is sustained. Discipline starts from desire-a desire to achieve a goal; to win a race, to build a better body, to ace a course. To sum up: both will power and discipline are learned, which means neuroadaptations, primarily in the pre-frontal cortex, account for these behaviors. Under normal circumstances will power and discipline have great survival value and are vital to a successful life. However the normal mechanisms that give us the ability to exercise will power and discipline can be taken over by two destructive behaviors that are not easily unlearned: addictions and compulsions. The potency of the stimulus and the susceptibility of the person (genetic or environmental) will determine if either develops. Part of the reason why addictions can and often do take such a firm hold on our lives is that we have been built with a “liking” and a “wanting” system. The liking system initiates us into action by activating the dopamine reward system. In turn the liking system activates the “wanting” system by giving heightened salience to, and incentives to seek out, activities initially producing pleasures. Repeated activation of these circuits by indulging in these activities (smoking for example) can, in some individuals, produce neuroadaptations that render the individual’s wanting system hyper-sensitive to the need for stimuli long after the dopamine system ceases to provide pleasure. These neuroadaptations are made through a learning process. That is good news, because what has been learned can be unlearned, albeit with difficulty. To be clear, addictions are not overcome by the traditional notion of will power (just do it). Much effort is required to reverse the neuroadaptations that lead to addictive behavior. But will power can be nurtured and practiced through a host of strategies that have been developed by the substance abuse treatment professions. Anyone who has successfully kicked the smoking, alcohol, drug, or over-eating habits has overcome more genetic and environmental obstacles than the average person. Developing will power in the face of these obstacles is by far a greater achievement than abstaining when there are no obstacles. Discipline can look like a compulsion. Behavior is compulsive when it is pursued despite interfering with progress on higher priority goals; health, family relationships, work effectiveness, for example. Compulsive behavior is rigid, automatic and independent from conscious control. Discipline is adaptable, voluntary, and under full conscious control. Addictions and compulsive behavior are treatable through medication and behavioral modification (neuroadaptations). For all of us, will power can protect us from long term harm while discipline can help us achieve long term benefit.